If you have done your homework already then you know the name to rely on for your Cordova plumber service needs is Larry O. Plumbing & Rooter. Since 1971 we have been taking care of our local customers by providing them with the finest workmanship possible. We don't consider the job completed until you are satisfied with the work and now we look forward to showing you firsthand how we earned the reputation we have. We still believe in offering good old fashioned customer service and the finest in quality craftsmanship and that shows in the work we do and the results we get. Too many homeowners settle for inferior service with the company they choose but this is your home, your money and your project. So don't accept anything but the best for any work you do for your home. You are going to love the work that we do; we can assure you of that. Think about just the fact that you are going to need a professional who knows what they are doing for your Cordova bathroom remodeling project. Someone may promise you they know how to take care of this job, but installing new bathroom cabinets is not the same as installing proper bathroom plumbing. You could end up with a room that looks pretty but is a plumbing nightmare and you won't even know it until something goes wrong (which won't take long). The same is often true of who you hire for even repair needs. They assure you that they know what they are doing and then leave you with a bigger mess then you started with. Our main goal here at Larry O. Plumbing & Rooter is to do the best job on every job we go to. We don't just aim to please we strive to exceed your expectations and provide you with the best experience possible. Before you opt for just any company you find, think about how much quality should matter when it comes to taking care of your home. Think of horror stories you may have heard about bad plumbing problems gone wrong and how you don't want that to happen in your home. At Larry O. 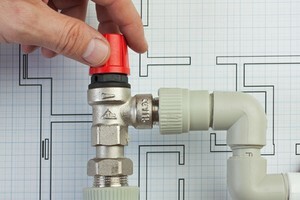 Plumbing & Rooter we give you the best quality work for the most affordable pricing. We can't wait to have the opportunity to work with you and demonstrate in person why we are number one. For all of your Cordova, TN plumbing contractor service needs, rely on us. We care about taking care of your home as much as you do. "We have used Larry O. Plumbing & Rooter for at least 37 years and would not consider using any other plumbing company. The service is reliable and the techs are professional." If you are looking for an Cordova plumber please call us today at 901-861-0277 or complete our online request form.